Source: Partnership for Public Service via Rein (2015). In essence, young Americans don’t trust their government and don’t see an opportunity to accomplish their goals, career and personal, on this path. 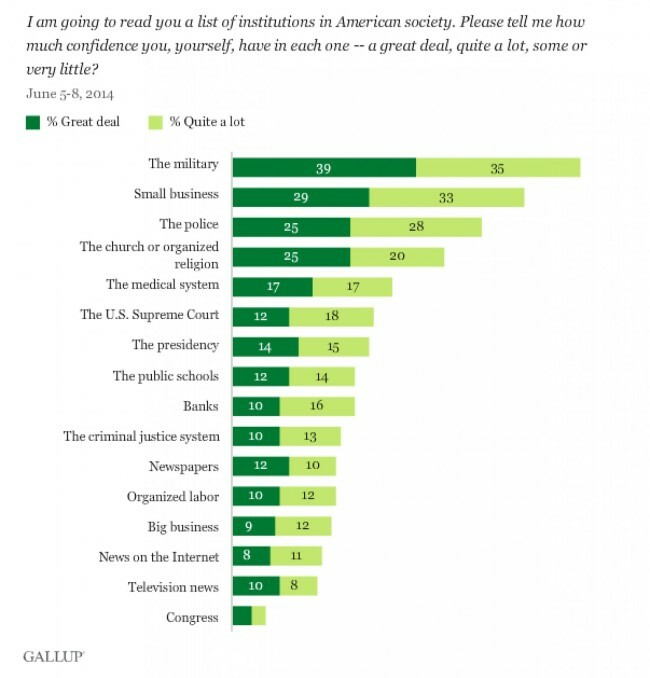 Gallup 2014 Survey on Confidence in Institutions. Note: This is for the general population, not just millennials. Via Cillizza. The government also suffers from a bit of a marketing problem. In many cases, agencies don’t know how to properly articulate and publicize exactly what they’re looking for and what benefits employees receive. For example, as Holden points out, the federal government does offer “flexibility for student loan repayment, and the Department of Education also has other programs in place for student loan forgiveness with years of service.”11 However, a quick glance at some of the level one paygrade jobs on the USA Jobs site (www.usajobs.gov) shows no mention of these benefits. Holden also says that there is a “lack of awareness about opportunities in federal government among Millennials, who may not know that their skills are needed.”12 Through our work with both tech and public servants in the federal government, we have definitely found this to be the case. While tech workers in San Francisco may want to contribute the skills they have, they don’t think of government as a place to do this or, if they do, they don’t know how to find and take advantage of these opportunities. So what can we do to change all this? How is the government adapting? Well, for one, government recruiters are beginning to embrace social media. Many agencies are exploring using social media to post jobs13 while others are working to increase and improve their presence on social networks in order to gain the attention of millennials.14 Other strategies that have seen success are ones that involve“training opportunities, online applications, up-to-date websites and benefits that focus on a work-life balance.”15 Travis Moore, the founder of Tech Congress (which I’ll discuss more below), suggests that government can be more flexible and creative in their hiring practices. 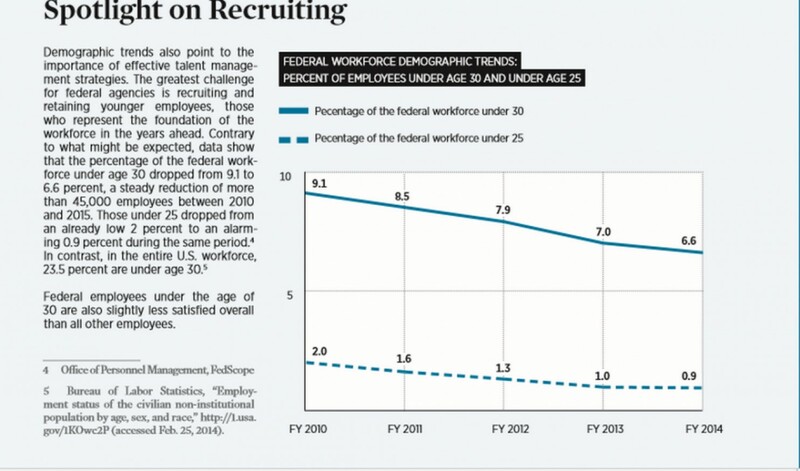 For example, rather than trying to hire millennials for full-time roles immediately, let’s give them a taste of government work through project-based roles, allowing young, smart Americans to focus on a single issue and see what they, and the government as a whole, can accomplish. For the millennial job-seekers who are worried about impact and mission, agencies need to publicly highlight their achievements, proving that their departments are in fact doing good work and achieving results. We hear countless tech companies talk about how their products are changing the world and they have the data to back it up. Government needs to do the same. They need to quantify what they are doing, using current and accurate data to show that they, too, are changing the world. And while the government can’t do much about its inability to offer comparable salaries to the private sector, studies shows that this is less important to millennials. What the government CAN do, though, is promote their benefits that make a difference. Highlight a focus on work-life balance, student loan repayment programs, and mentorship opportunities. The trust problem is a bit harder to overcome. At T4A.org, we’re working to rebuild this trust by creating safe spaces for elected officials to collaborate with the tech community. And this can happen at other levels too. We should encourage elected officials to personally and directly reach out to millennials, show that they care about the same issues, and that they’re willing to be held accountable to these needs and requests. And there are great organizations already doing work in this field. A few weeks ago we sat down with David Axelrod, who is a former adviser to President Obama and the founder of the Institute of Politics at the University of Chicago. This organization was started in 2012 and is “designed to ignite in young people a passion for politics and public service.” IOP accomplishes this through three programs, “[a] visiting Fellows program where political officials, policymakers, journalists and others involved in politics and policy share their experiences with students and others over an academic quarter; an expanded set of policy and public interest internships; and a continuous series of public speakers discussing current events and political life.”16 Another great organization is Tech Congress, which “allows talented professionals working at the intersection of technology and public life the opportunity to gain first-­hand knowledge of federal policymaking and shape the future of tech policy through a one-year fellowship with Members of Congress and Congressional Committees.”17 As Moore explains, they strive to operate under the tech model, to be lean, iterate, and experiment and to be honest about what works and what doesn’t. By giving tech workers, many of whom are part of this millennial generation, the opportunity to learn about government work and see where they can contribute, Tech Congress is helping to show young Americans that they can make change in government. These solutions may not be perfect, but they’re a good place to start. 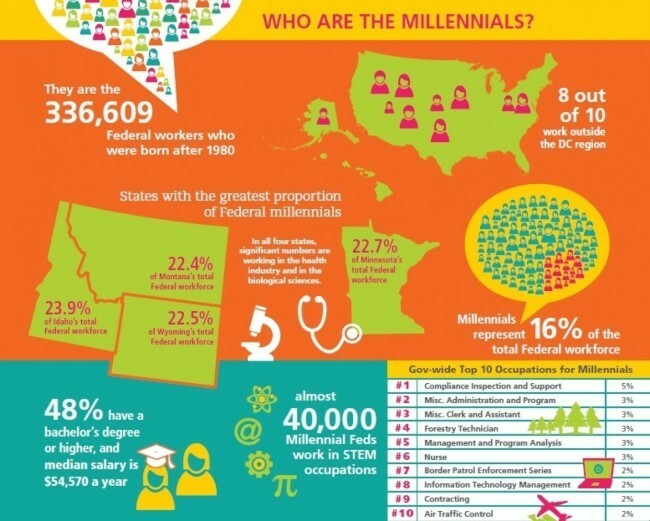 If we can begin tackling some of these problems, we may be able to reignite some millennial interest and engagement with government. We may see more turning out to vote, volunteering on campaigns, and yes, even applying for government jobs. Featured image via Rein (2015).